The 15 locations shortlisted for the first new towns in England in 40 years have been revealed by the government. Bordon, Coltishall, Curborough, Elsenham plus Ford in West Sussex have made the list, as well as Hanley Grange, Imerys, Leeds and Manby. Marston Vale and New Marston in Bedfordshire, Middle Quinton, Pennbury, Rossington, Rushcliffe and Weston Otmoor make up the 15. The 10 sites for the "eco-towns" will be finalised in the next six months. Ministers wants five of them built by 2016, with the other half completed by 2020. The plans have proved controversial in some areas with campaigners saying the idea is a way to evade planning controls. Most of the planned sites are expected to face local opposition, something thought to be worrying Labour strategists. Grant Shapps, the shadow housing minister, accused the government of "eco-spin rather than a genuine attempt to address the environmental nature of our housing". The new environmentally-friendly towns - low-energy, carbon-neutral developments built from recycled materials - will be the first new towns since the 1960s. The largest will provide between 15,000 and 20,000 new homes, with officials saying the towns should be "zero-carbon" developments and should be exemplary in one area of sustainability, such as energy production or waste disposal. They also want 30% to 40% of each eco-town to be allocated as affordable housing. The housing minister, Caroline Flint, said the new towns would help to tackle climate change, as well as providing affordable new housing. "We have a housing shortage in this country and that's why we need to build more homes," she told BBC News 24. "But we also need to think about sustainable homes in sustainable communities." The shortlisted locations would have the potential to provide affordable housing and "the highest green standards we can expect for the way we want to live our lives in the future", added Ms Flint. "It's tackling both the challenge of climate change and the need for more families to have a future in a home of their own." One of the 15 - Rossington in South Yorkshire - falls within her own Parliamentary constituency. The government plans to form a panel of experts who will subject potential developers to tough tests before they win the right to build the towns. Ms Flint said: "Bidders will have to meet the highest standards for sustainability, affordability and creativity. This expert panel will challenge developers to the limits." The government is stressing that any new towns proposed will have to go through the normal planning process, and that local people and other interested bodies will have the right to challenge the plans. It is reported the parents of tennis player Tim Henman have opposed the plan for the Weston Otmoor eco-town in Oxfordshire and have begun a campaign dubbed "Weston Front". Mr Shapps said the Conservatives would "always back plans for sustainable eco-communities". "But I'm afraid there are several on this list which will cause immediate concern to local people because they're being built on green fields," he added. "Of the housing we'll be living in, halfway through this century, three-quarters of it is already built. "Unless you do something about the existing stock, putting up a few eco-towns amounts to a tiny fraction of the total housing we will require." He also stressed the need to ensure inhabitants of new eco-towns did not have to commute in order to work. If this happened, the sites would be "not that environmentally-friendly at all", Mr Shapps said. According to BBC environment analyst Roger Harrabin, eco-towns are a way of increasing housing in areas of England where demand outstrips supply. They will also go some way to satisfying the demands of the powerful house-builders lobby, and will provide a laboratory for the sort of environmentally-conscious homes that ministers want to become the norm, he said. But there are concerns among environmental campaigners that most of the proposed eco-towns will increase car pollution because they will not be big or diverse enough to sustain viable public transport. Among 42 rejected locations were controversial sites in Hampshire, Oxfordshire and Derbyshire. Micheldever Station, Grovewood in Derbyshire national forest and Shipton Quarry were some of the areas which failed to make the shortlist. Most were on greenbelt land, threatened wildlife or were similar to projects previously denied planning permission. The developments on the shortlist of 15 are to be built over the next decade, as part of the government's plans for three million new homes by 2020. In September last year Prime Minister Gordon Brown announced that the number of towns to be built would be doubled from five to ten, because of the positive response to the original announcement. He said it would help boost house-building to 240,000 homes a year. 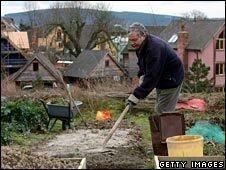 The eco-town idea was the first major policy announcement made by Mr Brown as he began his campaign to succeed Tony Blair as prime minister last year. It stemmed from a policy launched by former Deputy Prime Minister John Prescott two years earlier.